Twenty years ago today, snow began to fall on the Mid-Atlantic region. A lot of snow! Over the course of the next 24 hours, more than 12 inches of snow blanketed the nation's capital. In outlying suburbs of the Washington metro area, municipalities struggled to clear away nearly two feet of the white stuff. Further north, Philadelphia was inundated with 30 inches and roofs in New York City collapsed from the weight of the snow. The federal government was forced to shut down for nearly a week because of the storm. The District of Columbia and nine states were declared disaster areas. More recently, the 2009-2010 winter ranked among one of Washington's biggest and snowiest seasons. Nicknamed "snowpocalypse" and "snowmageddon," the February 2010 storm paralyzed the region with 18 to 36 inches of snow. 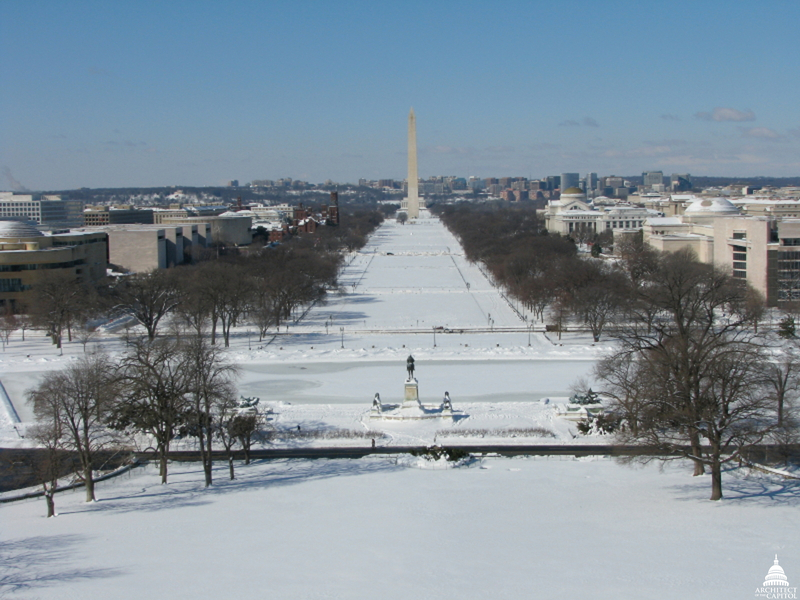 The U.S. Capitol on Feb. 7, 2010, and view of the National Mall on Feb. 10, 2010. 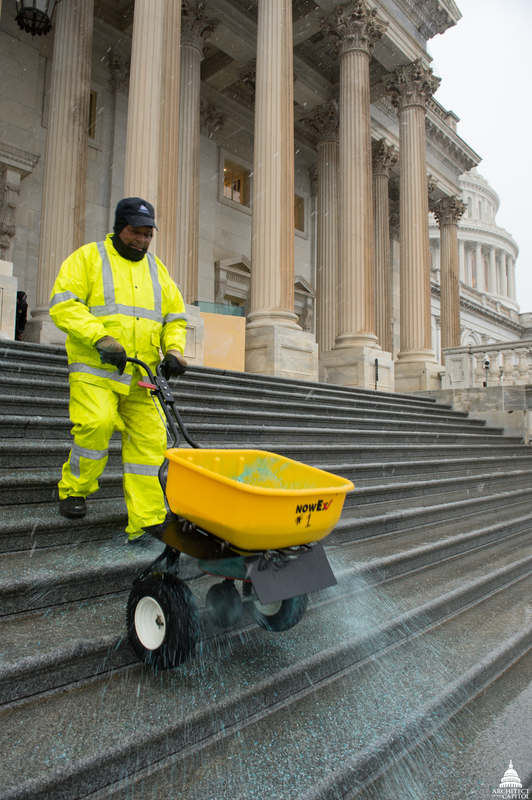 Rest assured, the unseasonably warm weather of the last several weeks hasn't stopped the Architect of the Capitol (AOC) from preparing for the inevitable snowfall on Capitol Hill. The AOC is responsible for the maintenance, operation, development and preservation of 17.4 million square feet of buildings and more than 553 acres of land. That is a lot of sidewalks, driveways and plazas to clear! 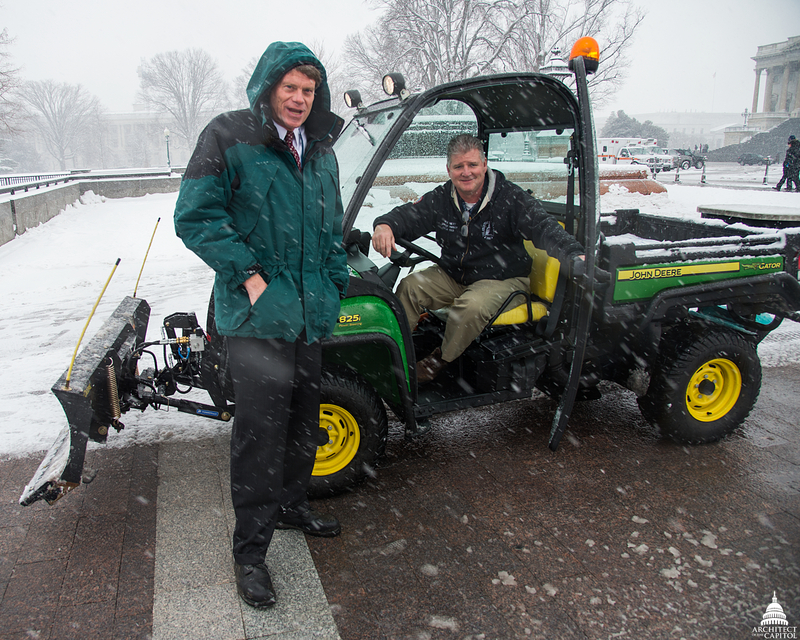 "We have about 14 miles of sidewalks, 7 miles of streets and drives and more than 20 acres of parking lots and plazas to clear and keep free of snow and ice," said Ted Bechtol, Superintendent, U.S. Capitol Grounds. "A significant storm requires a lot of work and cooperation to ensure the campus is safe for members, staff and visitors," he said. Every fall, the AOC begins preparing snow equipment, procuring rock salt and ice melt supplies, and reviewing the emergency and essential personnel snow response plans. "We do a lot of refresher courses for seasoned employees and training for new employees on the equipment. 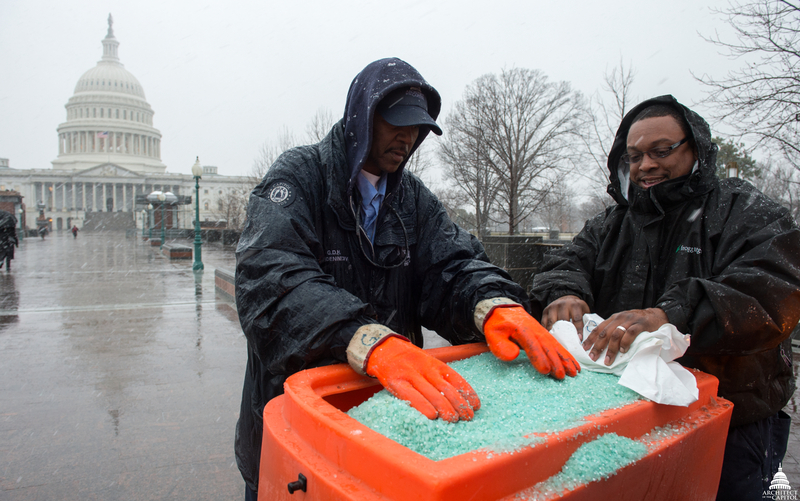 And we do several dry runs to make sure everyone is prepared for snow," said Ralph LoJacono, General Gardener Supervisor for the U.S. Capitol. 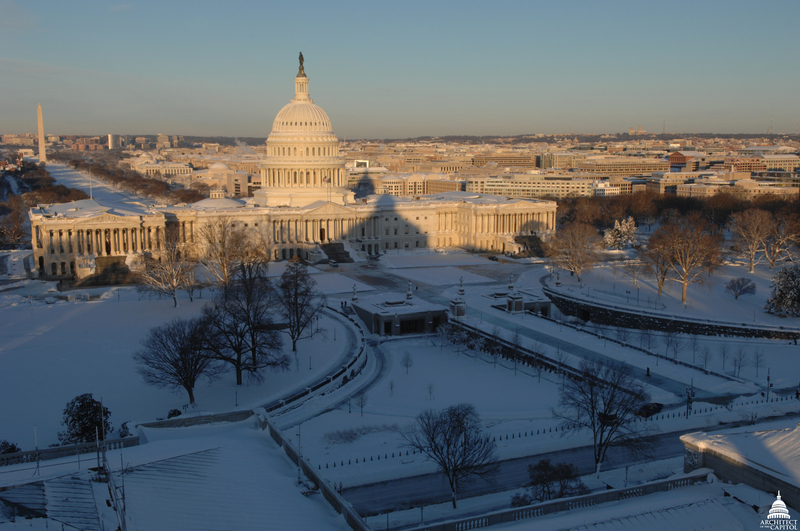 "We also coordinate and share information with the U.S. Capitol Police, AOC Office of Security Programs and the District Department of Transportation (DDOT) on forecasts, snow clearing needs and other storm preparation essentials," he said. Lee Dennis, General Maintenance Supervisor, manages 500 tons of rock salt to keep road surfaces clear and 20 tons of deicer for the sidewalks and steps. "If the surface temperature is below 28 degrees and we get 6 inches of snow or more, we can quickly use 200 to 250 tons of product to help remove snow and ice from the campus," he said. In general, it takes the AOC about two hours to hookup plows, load deicing products and secure the proper equipment in preparation of a storm. The goal is to be ready prior to the storm's arrival. Throughout the preparation process, coordination with colleagues on campus as well as area officials helps keep everyone safe. "We monitor road temperatures using a thermal reader. By casting a laser beam at the road, this device calculates the temperature of the road. We know by the road temperatures the type of pretreatment that is necessary. This information is shared with DDOT, too," said Dennis. Senate Fountain and the U.S. Capitol on Feb. 3, 2010. Over the years, AOC has identified First Street N.E. and Constitution Avenue to be the coldest area on campus. According to Dennis, "that intersection can be up to 3 degrees colder than other road surfaces. It is likely because building heights and mature trees block consistent sunlight." As a result, the AOC pays special attention to that area as storms approach. 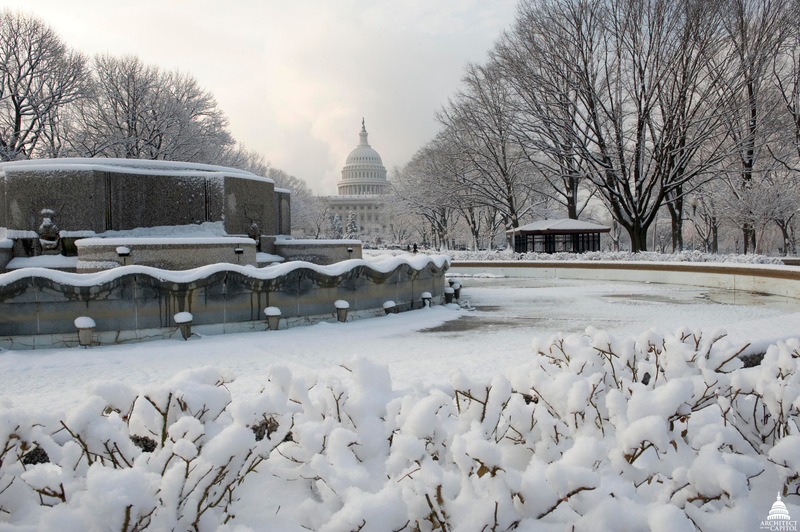 AOC personnel located in facilities throughout the campus – the Capitol, Library of Congress, Senate, House of Representatives, U.S. Supreme Court, United States Botanic Garden – are preparing for the worst and hoping for the best this winter. The warmer temperatures have helped the AOC get ahead on other projects, but as the winter season continues, everyone is keeping a close eye on the forecast. Many thanks to the folks at the AOC. 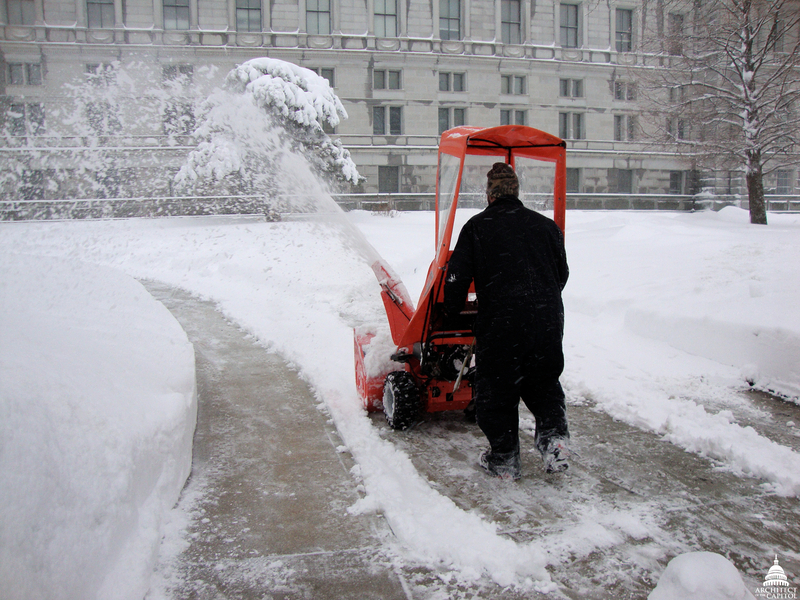 Sidewalks and paths are always cleared long before we arrive for work on the Capitol Campus. You all are the best.